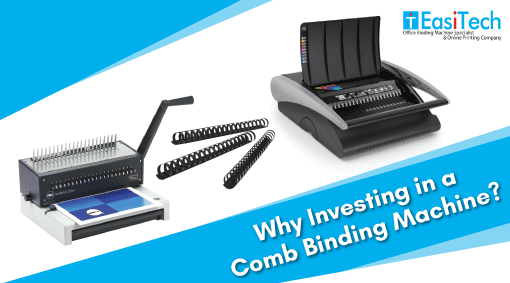 Home/Uncategorized/Reasons Why Investing in a Comb Binding Machine is a Good Idea! In today’s fast-paced world, a binding machine has become a lot more than a tool available at disposal. It’s a necessity that empowers professionals to create highly-finished drafts and leave an impression. From reports to marketing materials and company overviews to business presentations, people need an efficient binder to up their game and garner much-desired attention. Just make sure you create a perfect bound report, and if you do, you are likely to create the impact you are aiming for. Comb binding machines are known to deliver immaculate performance, unmatched accuracy and comes up with the best scope of being versatile. They can be used to create all sorts of professional documents and other creative works like scrapbooks, photo albums, self-published poem/story collection, school projects and more. Those who are more into creating a bright piece of work can connect with their dealer and opt for customization- this will empower them to add unique colors to their documents. You can also avail printed plastic combs flaunting your brand logo to create documents that stick out a mile. A comb binding machine Malaysia can accommodate any size documents. These machinery can bind different size document and give it a put-together look. With a comb binder, one can easily re-open the spine and add or remove pages as needed. Those businesses that have fluctuating requirements often prefer this machine that simplifies updating the document. Also by keeping the document flat, one can access a comb-bound document with ease. In most of the cases, people can buy a comb binding machine Malaysia at a fraction of their overall marketing budget. Once owned, the machine can help businesses to save some serious grands alongside improving your business prestige. We at EasiTech ensures bringing for you the best range of comb binders. Explore multiple variants with different punch capacity, document formats, punch capacity and more to create fresh documents for your business. Explore more here.